What can you do with Zerynth? You can program the most popular 32-bit microcontrollers in Python and connect them to the Cloud. But which microcontrollers and boards can you program? 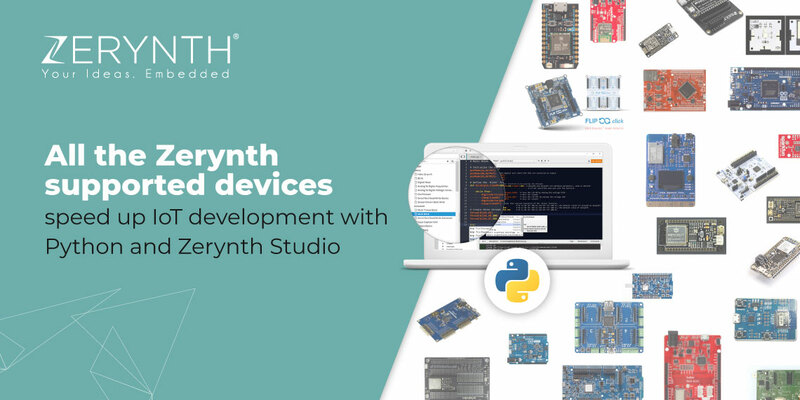 Some of the most popular development boards in the embedded and IoT field are Zerynth supported. There are so many that we don’t know how to select examples. So, we decided to give you a comprehensive list you could check out, next time you’re looking to start a project. You can see the full list of Zerynth supported devices here. Click on the board you want to find more about, and you’ll open the documentation for it. Currently, we support 8 boards with Microchip/Atmel MCUs on them. The boards are evenly distributed between two fields: the makers and embedded developers. For example, the Flip&Click board has the Arduino Uno standard pinout on one side, and four mikroBUS sockets on the other. It’s perfect for makers and easy prototyping. On the other side, we have the Xplained Pro Sam D21. It features the Atmel Embedded Debugger which provides a full debug interface without the need for additional hardware, significantly increasing the ease-of-use for software debugging. Moreover, Zerynth has been listed as a Trusted IoT platform partner by Microchip last year. More precisely, they offer a list of partner companies that are deemed as a genuine security expert on Microchip technologies, and we’re one of them. The newest one to be added to the list is the nRF52840 DK – a versatile single board development kit for Bluetooth 5, Bluetooth mesh, Thread, Zigbee, 802.15.4, ANT and 2.4 GHz proprietary applications on the nRF52840 SoC. It can be powered with USB, but also includes a CR2032 battery holder, enabling in-field testing of prototypes. Moving on the Espressif, the most numerous category on the list. We currently support 25 boards with Espressif microcontrollers on them. And we hope to support even more in the future. It’s no wonder that Zerynth has been recommended as a firmware toolkit for ESP32 by Espressif two years ago. It’s pretty clear why there are so many of these Espressif-based boards – there is a huge pool of ESP32 fans out there. And we’re one of them. The popular ESP32 microcontroller is an affordable WiFi and Bluetooth module with all sorts of peripherals that are suited for IoT: an ADC, and a DAC, a touch sensor, and two UART interfaces. What’s not to like? If you want to learn how to get started with Python on ESP32, this article will lead you through the whole process. Moving down our list, we come to NXP microcontrollers, and we have one development tool that’s Zerynth supported – Hexiwear. Developed by MikroElektronika in partnership with NXP, Hexiwear hardware includes the low power, high-performance Kinetis K6x Microcontroller based on ARM Cortex-M4 core, the Kinetis KW40Z multimode radio SoC, supporting BLE in Hexiwear. As you can see from the image below, it’s a wearable IoT development platform. Of course, if you want to get started with Hexiwear and Zerynth Studio, we have a tutorial for you. Learn more about Hexiwear on its official website. When it comes to Cypress, we only have one supported device, but we plan to add lots more in the future. It all started when we decided to make a demo with the Cypress team, for the Embedded World 2019 in Nuremberg. We started the idea with two Cloud dashboards – one on the Cypress stand and one on the RS components stand. Both dashboards will be showing temperature and humidity readings that the PSoC 6 boards we programmed in Python have picked up. PSoC 6 acts as the host MCU for a certified module based on one of Cypress wireless combo solutions providing 802.11n Wi-Fi and dual-mode Bluetooth. On each PSoC 6 Pioneer Kit, there will be a CapSense® (capacitive sensing) button which serves a special purpose. Pressing it will trigger a Blockchain transaction, to store temperature and humidity information. This explains how to use a blockchain for secure communication. As you can see, we support the PSoC 6 Pioneer Kit. There is one Zerynth supported device based on an Infineon microcontroller – the XMC4700 Relax Kit. Infineon XMC4700/4800 Relax Kit is equipped with the ARM Cortex-M4 based XMC4700 microcontroller (MCU) from Infineon Technologies. These kits are designed to evaluate the capabilities of the XMC4700 MCU. The Relax Kits feature an Ethernet-enabled communication option. And last, but not least, we have the ST Microelectronics based devices. Currently, we support 8 such devices. One of the more popular options is the Particle Photon – a complete Wi-Fi enabled development platform for creating connected devices with ease, the successor of the Particle Core (which we also support). You can check out all the other supported devices here. Now that we are done with the listing of all the Zerynth powered development tools, we wanted to make a moment to remind you of the Zerynth powered solutions. If you read the article you’ll see how Python programming is solving real problems in the industrial IoT, how it’s helping embedded developers with prototyping, and more. There are the Python programmable modular xChips by XinaBox, Riverdi IoT displays, the 4ZeroPlatform (TOI’s IIoT solution for plug-and-play data gathering, processing, and reporting), and the Wi-Ref, that’s based on the 4ZeroPlatform. Now, if you’ve already picked what Zerynth supported boards you want to use, go ahead and download Zerynth Studio. It’s free and available for Windows, Linux, and Mac OS.